After an unseasonably wet and cool spring, real summer seems finally to have arrived - bring on the water melons, sweet peaches and the earthy smell of ripe tomatoes with pungent basil. Benvenuti to the summer issue of the quarterly Marche Voyager newsletter. 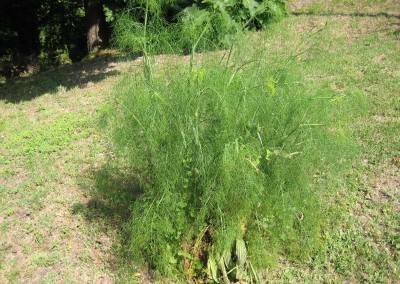 Wild fennel - finocchio selvatico - is one of the most distinctive wild herbs used in Marche cooking and summer is when you'll find it at its best. The fine, feathery leaves are used with broad beans (fava beans) and with roast, stuffed rabbit (coniglio in porchetta) while the dried stems and seeds are used, amongst other things, to flavour olives in brine. Its aromatic anise flavour is also essential when cooking lumachini di mare (sea snails, or winkles) and ordinary land snails, both common dishes in the northern stretches of the region. And the chicest of chefs now use freshly shaken pollen from the young yellow flowers. This summer sees the return of the weekly tours to Villa Imperiale, a remarkable Renaissance villa and garden in the hills above Pesaro. Until 25 September guided tours have been organized, including a bus ride from the centre of Pesaro, every Wednesday afternoon. If you're looking to live it up you might like to know that there are currently three five-star hotels in the Marche - two in Pesaro (Grand Hotel Vittoria and Excelsior) and one near Fermo at Torre di Palme (Villa Lattanzi). A major exhibition of Baroque art features the work of Rubens alongside paintings by many other great artists working in the Marche in the late 16th and early 17th centuries, and takes place in Osimo from 29 June until 15 December 2013. The main part of the show can be viewed in the magnificent Palazzo Campana with its main hall decorated with frescoes by Pomarancio. Osimo itself - a stone's throw from Ancona - is an attractive little town well worth a visit. The region can yet again boast one of the highest number of Blue Flag beaches of any region in Italy, only just beaten by Liguria. The region now boast eighteen towns with 29 beaches entitled to fly Blue Flags - new entries this year are the Lido di Fermo and Pedaso. 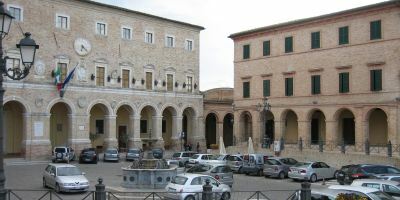 This month's image of one of the region's piazze, or town squares, features the main piazza in Treia in Macerata province. The town is best known for its sporting spectacle, the Disfida del Bracciale - featuring a fast and furious ball game dating from Renaissance times. Visitors to Urbino's splendid Palazzo Ducale may have to put up with some disruptions over the next three years as various parts of the complex undergo major restoration. Works are planned for the facade of the landmark twin towers, the warren of cellars, kitchens, laundry rooms, and stables in the sotterranei or basements, and the giardino pensile or raised garden. Once again Fano is the stage for the annual Fano Jazz By The Sea festival from 22 to 28 July 2013. Headline acts include Brecker Brothers Band Reunion, Chihiro Yamanaka European Trio, Michel Camilo, and Trilok Gurtu Band - Spellbound. One of the world's leading interpreters of the keyboard music of JS Bach is due to give a concert in July in the magnificent 19th century theatre at Cagli in Pesaro e Urbino province. The Iranian pianist Ramin Bahrami will be performing two Bach concertos for piano and orchestra on Saturday 27 July at 9.15pm. By the end of the 19th century, the Marche had a remarkable 113 theatres; today 73 of them still survive and have been carefully restored. A new survey, The Hidden Theatres of the Marche, has been written by Ian Arnott, an award-winning architect and Academician of the Royal Scottish Academy of Art. The result is a highly readable and informative guide with plenty of illustrations. The parents of the Californian wine guru, Robert Mondavi, emigrated to the United States from Sassoferrato in Ancona province in 1908.